The packaging and shipping stage of new product development has long been overlooked, but its importance is starting to be realized by more and more companies. The package is the first part of your product that the customer interacts with, but how often do you find yourself trying to open a plastic clamshell that is so tough, a regular pair of scissors can’t even cut through it? Not a great first impression! Besides the impact to customer experience, packaging can also impact cost. Not only in terms of the cost of the packaging, but in the cost of the shipping as well. I learned a not-as-difficult example years ago when I worked with a company that sold a four wheeled vehicle that was a cross between a golf cart and ATV. During production, the vehicles had to be shipped to a plant several hundred miles away to undergo final assembly. The vehicles were put in crates and stacked two high and two wide on a semi trailer. At some point they figured out that if they could shorten the box by 10 inches they could put four additional vehicles on each trailer. So their shipping costs would be absorbed by 28 vehicles instead of 24. The dimensions of the shipping crate became part of the design specs and they were able to meet it by leaving the front bumper and parts of the body unassembled and stacked on top of the frame. I didn’t ask, but I’d guess the savings on shipping costs added up to a few dollars of savings per vehicle, but when you make hundreds of thousands of them, it adds up! Achieving Flow to distribute 200 million boxes of cookies in six weeks! But the shipping costs aren’t the only place you can make in impact. Think of all the downstream ways the product is handled and how the package design might impact flow in those steps. This is where the Girl Scout example comes in. If you live in the US, you’re probably aware they sell cookies every year. But did you know they sell over 200 million boxes of them in six weeks? And since they use temporary distribution centers, you can imagine the logistics nightmares and bottlenecks this could create. I was fortunate enough to be involved with part of this process last week and was impressed by how well our regional distribution center was set up. 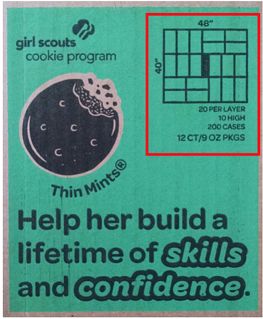 I don’t know if someone had formal training in lean or flow, or if they just figured it out with logic and prior experience, but it was a very efficient process and only took 20 minutes to get a minivan packed with 156 cases of cookies. There were a lot of examples of queues, batches and flow, but the example I want to share here is that each of the cases had the loading pattern, stack height, and quantity for the pallet loading printed on both ends of the box. Two examples are highlighted in the images below. 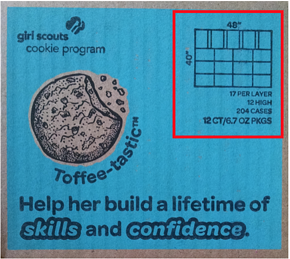 There are eight different kinds of cookies and each case is a different size. And since they only do this once a year and use temporary help, you can you imagine how much training would be required to teach all of the workers how to best load each pallet. Without consistency, the quantities would be random and impossible to track. I thought this is a great example of how to make information (and product) flow by being in the right place at the right time. And it highlights another example of the importance of great package design. So, the next time your team is challenged with a step of the design process, see if there’s anything you can learn from the Girl Scouts…! And let us know if you have any examples you would like to share. Know your project becomes late one day at a time and ready to look deeper into the benefits of Visual project management software? Watch a demonstration of PLAYBOOK!